When I decided to use "Trouble of the World" as my Battle of the Bands pick I was thinking about the troubles that have been and those to come. No sooner than the voting began on my Battle a new trouble in the United States reared its ugly head with the shootings just up the road from me in San Bernardino. I don't think we've seen any end to this type of event. Today--the day of this posting on December 7th-- being Pearl Harbor Day I can't help but wonder if this will be when the next attack occurs. Or will they pick a more subtle time. With the Christmas season approaching I'm probably not the only one experiencing some sense of uneasiness or expectation that something else is coming. Our jihadist enemies would like nothing more than to spoil the happiness and good will of the season. They want us to be afraid. And perhaps more than anything they would like to see economic collapse and dire social discord to befall the "Great Satan" of the United States of America. What's next? I certainly don't know, but the current administration of our government isn't gaining any confidence from me. I'm not sure the proper issues are being addressed here. 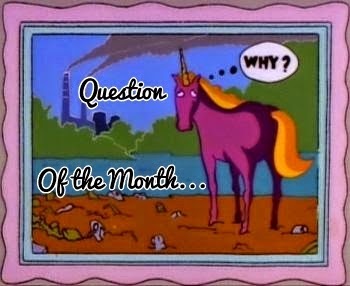 I could go on, but I have a Battle of the Bands winner to announce as well as a Question of the Month to discuss. 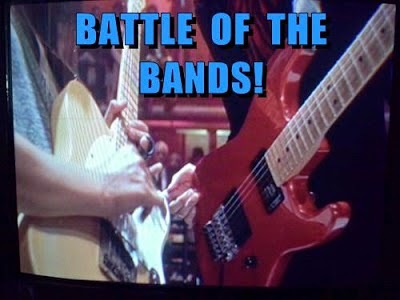 WE HAVE A BOTB WINNER! My song pick this time around was "Trouble of the World" which was a song that easily fell into my state of mind at the time I began preparing the post. As the days went on after my choosing this song, my choice seemed prescient with the Paris attacks along with the everyday violence going on in the Mideast as well as right here in my homeland, the "good ol' U.S.A.". It's easy for me to sink into these troubles so let me address the song and the Battle. Mahalia Jackson's version of the song is so exquisite in its sparseness, yet with so much spiritual depth. I'm not the biggest fan of this style of singing, still Jackson pulls it off well and I can really get into what she's singing. The organ, piano, and drum trio takes me nicely into the groove of the recording. It's like church at the jazz club. The version by Kevin Max starts out powerfully with a fine background in the instrument department. Some voters did not care for fuzzy guitar sounds. This is something I do like along with the backing vocals, the trumpet, and the solid trio like the one Mahalia Jackson used except a bit heavier. Late at night or maybe when I'm in a low time I'd prefer the version by Mahalia Jackson. Her version dives into my soul with comfort. However most of the time to energize me a bit more I'd prefer to listen to the Kevin Max version--his style is more to my personal preference. So my vote goes to Kevin Max. And now for the victory lap here's Mahalia Jackson's version of "Trouble of the World" as heard in the 1959 film Imitation of Life. Please be here on December 15th for another round of music Battle. Next time I'll be using two versions of a song I like a great deal. It's a song for our times. A few of you already know what song I'll be using. For the most part social conventions help maintain a certain sense of order when people encounter each other or are gathered together in groups. I'm not opposed to most accepted norms of societal behavior as they are guidelines as to how we should properly act when with others so that others are not left to feel uncomfortable and we can easily adapt without creating a disturbance. Social conventions typically make sense and keep things under control. One social convention that I think hinders us in many ways is the unwillingness to discuss controversial things like politics and religion (just taking two topics as an example). Most of us have lost sight of reasoned civil discourse where difficult issues can be talked about without parties becoming angry or upset. We hear the tales of places with "safe zones" or where speakers are shouted down by those who disagree. Sadly, intelligence and logic have often been abandoned in order to let feelings rule. If only people could sit down to examine issues of disagreement with a calm collected approach, maybe we'd learn more and begin to think rationally about the world. And if one party disagrees we learn the basis of that disagreement rather than name-calling or even violent reactions. To quote the dubious character Rodney King with an added twist, "Can't we all just get along and learn to talk about our differences like intelligent people?" Who would you most like to understand? Do you feel misunderstood? Are there any others who are different than you with whom you can discuss differences comfortably? I have a really good, and very conservative/religious, friend with whom we have had rational discussions about abortion. I know I won't change her mind and she knows she won't change mine, but we have discussed our viewpoints calmly and without escalation. And I do feel misunderstood but not b/c of my political or nonreligious leanings. Just my view on certain things. It's terrible what happened in San Bernardino. I don't know what the answer is. They can crack down on guns all they want. Criminals will always be able to get ahold of them. JoJo, more understanding about each other might quell some violence and antagonism, but I don't think we can ever eradicate it. Hey, your choice for Question of the Month mirrors mine! Thanks, as some of the others have been light and I worried I'd gone too heavy with my answer. But yes, the ability to discuss things without people growing angry would be nice. Alex, Sometimes I wish I could make some of my blog posts heavier, but heavy scares off a lot of readers. Love you phrase: jihadist enemies. It says what it is without saying the word, Muslim, which always sparks controversy because whomever I'm speaking with assumes I think ALL muslims are terrorists. I don't. I guess with this being said, I would like to get into the head of a jihadist...I REALLY don't get their thinking. But maybe I'd go crazy if I did. Em-Musing, to me jihad is a Muslim term so I am saying Muslim without actually using the name of the group. In a sense I understand where the jihadists are coming from, but I detest their thinking on their reasoning. Crystal, this is a little too specialized for me so I think I'll bow out. Besides I'm already doing one film blogathon that month so that along with my other things has my schedule full. Thanks for the invite. The ability to discuss and examine has long gone out the window. Would be so nice if people used their brain and discussed things civilly and not all "You're wrong I'm right boo hoo"
Pat, I mostly avoid discussing current affairs and such unless it's with certain people whom I know very well. On my Facebook feed, I have friends who post from both political sides. The irony is how they actually agree on so many points and do not know. My dad called it having float. The ability to disagree with a friend even have an argument with them and still be loyal to the friendship. There is so much we have lost with the helicopter parent mentality of My way or the highway. Ann, I think we mostly agree with others, but it's a few minor points that raise disagreement that can often be venomous. I've felt nervous about the upcoming holidays and travel with the potential for more violence anywhere, anytime, by anybody. I guess that's what the jihadists want, so I'll continue on anyway. Tamara, if we don't carry on as normal then the terrorists have done their job successfully. I want them to fail. It is true that no one seems able to discuss differences of opinion in a reasonable way. There's no logic, only I'm right and you're wrong. Susan GK, the saddest things it to see the universities becoming so intolerant of opposing ideas. The next generations are going to have big problems if they can't deal with opinions that aren't the same as their's. The world is going through a difficult phase, let's hope we come out of this on the other side with peace and compassion. Damyanti, it would be nice, but I don't have a lot of confidence that it will happen anytime soon. I only talk politics and religion to is my mom because she thinks like I do. My other family don't talk openly about these things and my friends get too aggressive when you don't share their opinion. Chrys, it's always easier to talk about controversial topics with those with whom we agree--that's mainly what I do these days. When things get heated then I tend to shut down to avoid the conflict. Tolerance has also gone out the window. Being right seems to have become more important than being able to discuss reasonably and agree to disagree. A thinking person is going to question things, but a person who just does what he is told can't understand that. A friend of mine said she didn't like to 'make waves', but I'm one of those who doesn't mind disturbing the flow of water. . .I question everything, because most of it is just another person's opinion. . .
DG, I try not to be the instigating force who makes waves, but if I feel there is injustice, ignorance, or lies in what someone is saying then I prefer to attempt to set things straight as I see them. I put up with a degree of slop, but clean up as much mess as I can if it becomes necessary. Sorry to hear of the troubles near to your home, it must be frightening to be so close . Great post to read, didn't pick the winner of BOTB. Yvonne, I can't say I was frightened, but I was angry. I can discuss just about anything if people are willing to not be too boisterous. I can deal with a certain level of rudeness as I wait for the other person to express themselves before inserting my own thoughts as well as gently letting said person know that they might be a little indelicate. But all that shouting business done to intimidate others just grinds me in a bad way. If that person can't try to tone down them I will very likely end my part in the discussion pretty quick unless I feel it is a necessary discussion I need to stay in. Sheena-Kay, it's not always shouting that incites the most, but branding, labeling, and accusing in negative ways. Too many feelings encroach on disagreements. I tend to stay calm and rational, but my tolerance decreases as barbs are cast my way. Lee, you and Alex hit on similar topics. Love Rodney King's statement. And yeah, I think a lot of people are looking over their shoulder, especially around Christmas. Malls would be obvious targets. Stephen, another reason for me to avoid malls. I rarely go to malls anymore, but not because of terrorism fears. Lee, I sided with the loser in the BOTB. I sorta figured Malahia would win, though. Troubles of our World may shake me emotionally, but they never touch my spirit. I'm on solid ground and won't be moved. I'm happy to have my faith in Jesus to keep me strong when things are so chaotic around us. Liberalism has gotten a tight hold all around the world and the good ole USA has fallen to it, too. My prayers are things will change in the next election, but that means a whole lot of people have to change. I don't doubt that God can make this happen, but the question is will He see fit to move the hearts of those around us? The current administration are terrorists. The Dem-wits lie, cheat, and steal from us and the Repugnants have no backbone to stand against them for the common good of the American people. Both sides are destroying the USA. *step off soapbox* I'm sorry for the temporary rant, Lee. God is in control. I will look to Him always for all things. Good battle, my friend. Enjoy this beautiful, blessed Christmas season inspite the Trouble of the World. Cathy, I think liberal thought from the sinful standpoint is here to stay for awhile. Love your rant--it means I don't have to say it. Maranatha! It's wonderful to be able to have a mature, respectful discussion about politics, religion, etc., with someone who holds opposite from you. It's a shame some people feel they can only discuss such hot-button issues in a shouting match full of name-calling and cliché catchphrases, instead of talking about the issues rationally and finding common ground. I'm old enough now to no longer care if a friend is liberal or conservative, so long as s/he expresses him or herself articulately, respectfully, and intelligently. It can also help with writing, as a good writer should be able to create any type of characters, of any religion or political persuasion. Having firsthand experience with people outside your own bubble is a fantastic way to make authentic characters. Carrie-Ann, whatever happened to the good old-fashioned method of Socratic discourse. We need more Mr. Spock-like thinkers. Great battle, good buddy! Do you ever lay a demographic template over the vote results to see if the voting is split along the lines of age, gender, etc.? I voted for Ms. Jackson (not Janet). I am happy to learn that her performance touched the hearts of other voters and that she emerged the winner of your contest. Have a great week, good buddy Lee! Shady, I haven't paid too much attention on the demographics of the voting, but it seems that the more traditional artists usually get the wins. Star Wars hasn't affected me since when I worked for the costume company--busy times when the costumes were all the rage for Halloween. I would like to have something intelligent to say, but I've been fixing a toilet all morning and, now, I have to run out the door. I wish we could all just get along with our toilets. And, maybe, people should engage in discourse while using said toilet. It's difficult to get up in arm while sitting on the throne. Andrew, my mind is already working on some comebacks for this comment, but I guess I'll keep them to myself so this discussion doesn't go down the toilet. It would be nice if people could discuss these topics without getting into heated arguments but I don't see it happening. I've seen people standing in line at the bank I worked at almost come to blows over election politics! I've seen my stubborn mother stop talking to people over religious arguments. Grrr. Wars are still being fought over religion and will contine to do so long after we're gone. But it sure would be nice wouldn't it?! Barb, the universities and our school systems should focus on teaching the art of rational discourse and reasonable discussion. Too much focus has been give to people getting in touch with their feelings and inner selves. This only leads to more narcissism and irrational reactions to points of disagreement. What would I change? Political correctness. It's mind boggling to think that if it walks like a duck - it suddenly becomes a swan because it's 'nicer'. That being said, I was always taught to never argue with an idiot for passers-by won't be able to tell the difference between you. Been listening to excerpts from the tragic day of infamy and can't help hearing the rich, smoky voice of Ms. Jackson. Glad you shared, Arlee! Diedre, our "PC" culture has gone to a point of ridiculous extreme. Your quote about arguing is a good advice to follow. I'm, of course. appalled at the mass shooting. And I'm appalled at how our government is mis-managing foreign affairs. There's no consistent policy. There doesn't appear to be a smidgin of understanding about what that part of the world is all about. The Koran does not teach murder, but the politics is all about death to America. And while Obama tells us that this shooting might be about work-related issues, I'm gnashing my teeth. When will we understand that our nation's at risk, and if we don't take a stand and stop "drawing lines in the sand" then redrawing those lines and stepping back we may all come to understand how the 14th century works. Forget Assad. Don't topple more dictators; they keep stability. Work with that tyrant Putin and Europe first, then deal with Assad. Be a leader, Mr. Obama. OMG! See what you've done, Arlee? You've unleashed my political side. Yes, to more open and real debate. Why are we afraid of that? C.Lee, good points and you're always welcomed to leave such comments--it's the point of my answer to the question. We all need more education and enlightenment in order to come to the wisest conclusions. I like your answer to the question of the month. I don't often discuss religion or politics, especially online, because of how emotional people get. It's like we stop listening and thinking. Patricia, sometimes I've very hesitant to bring up highly controversial topics on my blog. I almost completely avoid it on FaceBook. Now and then I will let something slip through on Twitter, but I don't worry much about those being seen by many people. My Swiss family (daughter,husband, Benjamin) are coming for Christmas! My son John also. They are liberal to the point that we both have agreed to ban religion and politics topics. Susan, I tend to avoid discussing much with my children as they don't always like the way I think. I just want to enjoy their company since I'm with them so infrequently. I smiled at Susan Kane's response! The dinner table was always a hot bed in my family while growing up when politics was discussed! If only we could really listen to each other, give the other their due, their space to say without interruptions and not have the need to shout the other down, all would be a huge lot better... it's ok to make waves and be in direct opposition to the other's viewpoint, but let the other speak ..
Susan S, I don't like heavy discussions during dinner and we never had them in our household when I was growing up. I like the idea of listening, questioning, and then countering with any disagreements. When rationality is in control then conversations can be much more civil and productive. I'm glad Mahalia Jackson won the battle. Good one! It's beyond me why people take differences of opinion as personal slights. Resorting to name calling just means they have no intelligent response. No point arguing, because nobody is changing anyone else's mind. It's a waste of time and life is too short! Debbie D, often I'd prefer to change hearts and minds, but it rarely happens in a short term argument. You have a very Merry Christmas season as well. The troubles of the world today do put a damper on the season and I agree that we probably won't see an end to them any time soon. I pray for revival among the Christians. This world needs to hear the truth of the Bible even if it's not always politically correct. It is sad how easily offended people get and they don't take the time to reason and listen to someone else's point of view. Elizabeth, a revival would be nice, but I'm seeing things go the other way in many churches and it's a disturbing trend. A lot of folks just don't want the truth from the Bible and would rather make their own interpretations of what's right or wrong based on their own feelings. Great answer. I point the finger squarely at the internet. Michael, the internet does bear a big responsibility in one sense, but there are people who are reading what is on the internet and it's up to each of us to draw an appropriate conclusion based on more than one source of information. Fairly close Battle, LEE. Anytime they are decided by 5 votes or less, I consider them successful contests. I've had plenty of political debates and discussions about Spirituality / Religion. I do not hold ANY beliefs or opinions that were formed prior to doing lots of objective research in advance. In other words, everything I say is based on carefully analyzed information and logic. What I've found, however, is that a great many people decide what they want to believe FIRST (usually founded on emotion and/or what SEEMS like it should be the acceptable, nonjudgmental viewpoint) and then they read only those things that seem to validate their preconceived positions. Arguments occur when they refuse to even consider another viewpoint, refuse to carefully examine the available evidence that purports to substantiate the opposing belief, and react emotionally because their position has been challenged by another person. Ad hominem attacks indicate that the person is on unstable ground and they fear to reconsider their belief. I read the pros and cons about each issue BEFORE I make up my mind, and it can be frustrating when trying to get a person to consider a different viewpoint when that person simply will NOT weigh the evidence you present in an objective, intellectually honest way, but choose to attack you personally instead. There's a lot of political and religious intellectual dishonesty out there. Good luck trying to get a person willing to deceive himself to even consider opposing evidence. STMcC, feelings are much more difficult to sway than logical deduction and facts. Some people will cling to their beliefs no matter how ridiculous and that's when the panicked defense enters the picture. I'd like to see more national debate of issues presented to the American people on a regular basis instead on divisive politicking. I'm sure it's not going to happen, but it's something to dream about. Heres a line which I suppose is true.... learn to tow the line or else you're going to have big problems. Now Marcos Aurelius is a different kettle of fish whose works expound with true eloquence. For instance - If its not right don't do it, if its not true then don't say it. I think life is a bit of a balancing act probably somewhere between these two. Spaceguy, ah, but therein lies part of the problem. Truth? What is truth? That's an age old question. Some people believe utterly ridiculous things to be true and will stubbornly defend their positions no matter how nonsensical they are shown to be. I have learned not to talk politics unless there is an understanding that we can agree to disagree. I almost lost a valued friend over politics -- actually, I lost that friendship for over a year because we didn't talk at all after our argument -- and when we got back together we both vowed to never discuss politics with each other because we are at opposite ends of the spectrum. I tend to stay away from talking politics unless I'm in the company of like-minded people. I don't like arguing. And I feel passionate about my beliefs. Not to say that I can't understand someone else's viewpoint because I certainly can but when those opinions are coupled with passion, defending your beliefs can erupt into unpleasant discord. I choose not to partake. With regard to religion, I often ask people of different religions about their religion because I like to learn their traditions and rituals. I find it interesting. Michele, if points of disagreement could be taken one at a time, dissected and analyzed, then maybe those who are opposites could begin to find that common ground that indicates that differences aren't really so great. Few of us have the patience to do this though. Arlee, to have a civil discussion about things like politics or religion requires finding people with open minds, those who are willing to think about, analyze the history of, and reexamine their own beliefs. It's kind of hard to do, and I don't think it's all that new. If you think back to the writings of those who wrote the Declaration of Independence and later, the Constitution, you can find plenty of evidence of bickering and outright battles over the same kinds of things people bicker about today. Patricia, but at least the founding fathers got things done. I guess people will always be bickering about something. Madilyn, I try to avoid getting drawn in when things start getting out of hand. Silence is golden. Birgit, it's always nice to have someone with whom you can comfortably vent. Yeah, and sometimes they don't actually call you names per se, but they'll accuse you of "crazy talk" and of not making any sense... and that's WITHOUT EVEN FIRST EXAMINING WHAT YOU'RE BASING YOUR BELIEF ON. You know, it just sounds preposterous, therefore IT MUST BE, and you are guilty of "crazy talk" and of not making any sense, regardless of the facts that led you to your conclusion. Because, you know, truth has NEVER been stranger than fiction. Right. StMcC, and I've read some pretty strange fiction. And probably talk some pretty crazy talk as well. Another loss for me this week, though I did agree with your pick. I have disagreements with one of my friends all the time. But we never let a disagreement come between us. Sometimes you have to agree to disagree. Jeffrey, I tend to clash with family members. I try to educate them on the truth, but they usually resist so sometimes we just have to let our disagreement rest and go on to something that holds less conflict. If there's one thing I hope my children learn, it's to be tolerant. There is such a wide range of religion and politics in my family, that I am typically a closed mouth person. I've got my parents who complain there are more people on welfare than there were during the Great Depression, and then I've got my husband who brings up that it was because of the Great Depression that we have welfare, so yeah, there are more now because it didn't exist back then. I'm Christian, my husband's agnostic, my sis-in-law is atheist, my mother-in-law is Jehovah's Witness, and my cousins are Mormon. There's so much intolerance in the world that I avoid those topics. Loni, I think the level of tolerance can be correlated to one's devoutness to their religion. It's a good idea to be educated about what's in the world as well as history and its implications on where we are today. Religion is a real hot button topic. It would be nice if we could have civilized discussions. In fact, I think they're healthy. And, it's okay to agree to disagree. I can't talk about a certain issue with a good friend, but I can still be her friend. I have a hard time understanding people who use exclusion as a way to try to control others. And, of course, it makes no sense to retaliate with violence. Mary, violence is never appropriate in my way of seeing it. We learn from discussing things we don't understand or know enough about. If only we could all just discuss our disagreements logically. I think because we are an emotional being, we have trouble. There are rifts in religion, education, and especially politics. I need to examine a subject to be able to discuss it logically. However, I don't see any logic in politics. Perhaps it is because I don't understand the discipline. Thanks for starting the discussion, Lee. Victoria, emotion typically wins out over logic which is too bad. Emotions are a blinder to reality in many cases. Lee, That was some battle. I'm glad Mahalia took the lead - even though i was okay with either version - mostly. Great battle! See you Dec. 15th, sir. >>..."Sadly, intelligence and logic have often been abandoned in order to let feelings rule." Dixie, if you enjoyed this Battle then you might be equally intrigued with the next one. A BATTLE that ended as it should have, IMO. I've seen my share of those folks who can't have a civil conversation. When disagreements occur I think it's best to talk to the person privately and not in a public forum like the 'comment box' of a blog. I've never been concerned with being 'popular' so I haven't felt it necessary to 'work things out' with someone who displays unreasonable tendencies, and I'm never going to work those things out in public, especially when I'm the one being attacked. I don't actually think I've ever attacked someone 'in print'. Usually I just choose to walk away. Life is too short to argue with fools. What is the saddest is when your friends are the ones doing the attacking, either by actually joining in the fracas or by simply staying silent. FAE, I agree about settling personal differences though I guess in some cases with on line disputes a comment box is our only accessible option. Like you I will walk away or ignore personal attacks. I think the biggest missed opportunities are when we can educate or learn about things like political or religious differences by carefully going through point by point in order to come to reasoned conclusions based on facts and logic. Emotions blow just about everything out of proportion when it comes to disputes. Dezmond, I thought the voting outcome was a good one though my favorite didn't win. The faceless anonymity of on line communication allows for some extreme behavior. There are a lot of different voices out there all wanting to be heard. Lee: I agree totally with your statement that we need more tolerance and less anger in our civil discourse. For my part, I regard Obama as one of the seven best Presidents of the last century. He made a serious mistake going after healthcare his first term - too divisive - but he learned form that, and I fully support his careful moves in Syria and elsewhere. However, I respect your right to disagree. Let me suggest that you ignore all this hysteria on TV. We lost more men in one day of Tarawa than all of the mass killings to date, horrible though the have been. ISIS stole whatever weapons they have from us. They have no way to replace or maintain them. We will prevail. Jack, I don't get frightened by what I hear on TV though I find much of the politicking rather entertaining. Talking about disagreement can be highly productive when everyone keeps their heads.